The Thai island of Koh Samui is like an ageing theatre in which tourists play out a renowned and repeated script. For years, it has been known for the bustling stages on which the principal resorts of Chaweng and Lamai play out their offering to backpackers, and package tourists from all over the world, sent to play in paradise on a shoe-string. However, the theatre is undergoing a dramatic makeover. The grand old leading lady of Thailand’s tourist destinations is experiencing a renaissance as the island welcomes increasing numbers of luxury hotels, celebrity chefs and increasingly sophisticated travellers. Head south of the bustling beaches and life is tranquil, showcasing a side of the island where beaches are more populated by wildlife than tourists and stylish hotels are hidden around the coastline. The leading lady is the X2 Koh Samui Resort, which spreads over five acres of Gulf of Thailand waterfront. This brings a contemporary edge, blended with urban styling as local materials such as bamboo and wood, balance polished grey concrete. An expansive wooden boardwalk, peppered with palm trees, leads to the 4K (pronounced Fork) restaurant and bar, where international and Thai plates, surprising cocktails featuring a local rum and snacks can be enjoyed overlooking an azure lagoon in a refreshing sea breeze. The hotel is also home to a capacious swimming pool, the deepest in Koh Samui, along with the X2 spa which provides, among other things, Thai massages plied by local therapists with incomprehensible strength. The tiny women rid the body of tensions using a combination of techniques, herbal poultices and various body parts; thumbs, elbows, knees, fists, hands. All treatments are included in the price of the resort for guests or are available to visitors for a fee. Another feature is a string of Bauhaus-inspired pool villas, each set in a private garden protected from the outside world by a foliage drenched wall surrounding a secluded pool. The villas are neutrally furnished and benefit from cathedral ceilings and a vast bathroom. There is no need to leave. Yet with so much to act out on Koh Samui, exploration is recommended. Adventure sports including kayaking, parascending, diving, and zip wire networks are all available. Full-day excursions offer wildlife trips featuring elephant treks and monkey shows, while a visit to the Wat Khunaram temple includes a rendezvous with the Mummy (as in mummified) Monk, Luang Pho Daeng, who has been left to rest in peace exactly where he died during meditation in 1973. It’s slightly disconcerting to see him with his Ray Ban shades in place. A defining Koh Samui experience is a day on a traditional Thai long-boat skimming the gentle waves as its outboard motor, at the end of a long pole (hence the name), powers through the crystalline waters. From a tiny pier south of the island, a 40min trip whisks visitors to a secluded cove on the island of Koh Tan. A coral reef is teeming with fish of all varieties. Boats are equipped with fins, masks and snorkels and guests are invited to channel their inner Jacques Cousteau to discover the hordes of exotic creatures that lie beneath. Lunch is served on a beautiful tropical beach of Koh Mat Sum with obligatory coconut trees providing the necessary shade. As we gaze out over the hypnotising scene, the smells of a Thai lunch awake us from our serenity as the chef chops, stirs and grills our beachside feast - she has literally bought the kitchen with her. Papaya salad, chicken satay, pork patties are all served on a rickety bench. Koh Samui has become a haven for food lovers and has built a reputation for mouth-watering menus and locations for the intervals between swimming, exploring, relaxing or adventuring. Several international Michelin star chefs have retired to the island, and there is a bewildering array of restaurants for every taste. Tree Tops is one of the most beautiful, as each table is in an individual tree house. Cocktails served in globe glasses sitting on dry ice precede a tasting menu celebrating the best of international cuisine including Australian beef, New Zealand lamb blended with local fruit, fish and seafood. Dessert is prepared at the table in a magical elaboration of sorbet, mousse and ice-cream. At the other end of the location spectrum, in the busy streets of Lamai, nestled between the night market selling Thai souvenirs, the bewildering array of bars and a local open air Thai boxing ring, is Seventy Fahrenheit, possibly one of the best Thai food establishments on the island. Surprisingly, it is run by a Frenchman, but it is clear he has a winning formula with his locally trained chefs preparing a grand selection of taste- tantalising Thai curries, the best I’d tasted. 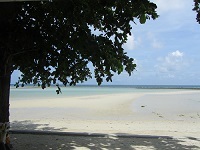 X2 Koh Samui can be reserved direct through www.x2resorts.com/resorts/samui and is a destination in its own right.